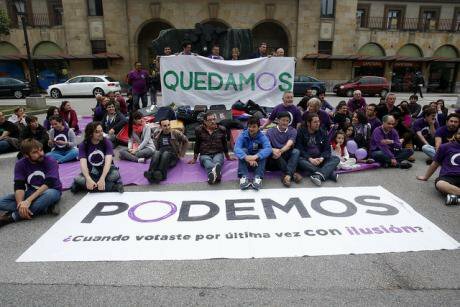 Podemos in European elections.Flickr.Some rights reserved.“They do not represent us”. This was Podemos’ rallying cry during the last European Parliament election campaign of May 2014. “They” are the “caste”, a word that is now part and parcel of the Spanish political vernacular. “Us” is the people. The caste is the Spanish establishment: that group of politicians and top businessmen which, according to Podemos, have ruled the country for the last 25 years. One of the main unintended consequences of the Spanish transition to democracy, as it were. Its main paradigmatic illustration is revolving doors: a systematic mechanism where politicians that occupied key positions in past governments came to take up important posts in the boards of the Spanish so-called “Ibex 35” (the crème de la crème of Spanish international business corporations, formed above all by financial entities and housing and real estate companies). The examples abound: both former PMs Felipe Gonzalez and José María Aznar are members of the boards of two important Spanish companies. There are also exceptions: the only living Spanish former PM who is not a member of any big company´s board is Zapatero. But the list is not confined to almost all former PMs: it would also extend to former ministries, secretaries of state, directors general, and so on and so forth. This is information that everyone--the people--knows in Spain. And this is one of the main reasons why Podemos´ impact has been so powerful. The problem was how to bell the cat. Podemos did. In the last European Parliamentary election, Podemos obtained 5 seats. This outcome was completely unexpected. No opinion poll had foreseen such good results. Since then, an element of the Spanish political and economic elite, aided in this by a non-negligible portion of the country´s intelligentsia, has declared war on this emerging political movement. Podemos has been accused, one after the other, of populism, warlordism (“caudillismo”), messianism, and of being Marxists, Leninists and anarchists at the same time. Even Felipe González has joined in the fracas, stating that the movement is formed by a bunch of “regressive utopians”. All the criticism that Podemos is receiving is only the clearest evidence of the relevance that this movement is attaining in Spanish politics – and accordingly, of the fears that this is provoking in a significant sector of the Spanish political and economic elites. Of all these criticisms, the only one that can be taken seriously is the one that accuses Podemos of being a populist movement. The connection of some of its leading figures with the current Ecuadorian, Uruguayan and even Venezuelan governments, has paved the way for this criticism to emerge. But is Podemos really a populist movement? Even a cursory look at Podemos’ platform confirms that it is highly implausible to consider Podemos a populist movement. Perhaps the time has arrived to make a clear difference between two rather distinct isms - between populism and popular-ism. The first voluntarily makes political promises knowing that these cannot be kept, with the sole purpose of winning elections. Whereas the second volunteers political promises on the people´s behalf knowing that they are difficult but not impossible to achieve–and, as a result, that political party puts itself in a position to win elections. Podemos is conducting an exercise of the second type and not of the first. More specifically, this movement has in the last 4 weeks (from mid-October to mid November 2014) launched itself as a political party (before, it was only a social movement with no clearly defined organizational structures). It has also decided on the main proposals that will constitute its future political platform. The process was bottom-up and very open: virtually anyone could register on Podemos’ web-page and vote, from among around 100 proposals, on her favourite five. The results are as follows (in order of preference): 1) defense of public education; 2) measures to combat corruption; 3) gain the right to housing and stop evictions; 4) defense of public health; 5) a debt audit and measures for the restructuring of the Spanish debt. A brief survey of what will therefore constitute the top of Podemos´ future agenda suffices to show that all these demands (with some qualifications to be made later regarding the last one) command wide support in Spain. According to CIS (the Spanish Public Opinion Agency) surveys, most Spaniards have a good opinion of the Spanish public education and public health systems. If anything, they think that they are underfunded and would be ready to pay even higher taxes to better fund public social services (including education and health). Corruption has become the second most important problem for Spaniards – the first being unemployment. As regards housing and evictions, Spaniards do not perceive them as at the top of the Spanish “major problems” list. However, the PAH (the movement against evictions), created in 2009, has become one of the most popular Spanish social movements in the midst of the crisis. In fact, its celebrated former leader, Ms. Ada Colau, has stepped out the PAH´s leadership to become candidate of Ganemos – a political organization with which Podemos might merge – for the next mayoral elections in Barcelona city. But it is around the fifth point (debt audit and debt restructuring) that the main political lines of battle are in the process of being drawn at this moment in Spain. To the best of my knowledge, no serious surveys have been taken on this issue in Spain or elsewhere. So it is difficult to know what Spaniards think of it. However, the Marshall Fund, in its Transatlantic Trends surveys of 2012 and 2013, discovered that, of all surveyed countries, Spain was the country with the highest percentage of people who wanted to leave the euro. So there may well be reason to believe that Podemos is not precisely going solo in its debt restructuring proposal. In any event, almost all Spanish left and centre-left political parties agree on the first four bullet points mentioned above. However, Podemos is the only political party that has forcefully defended not a Spanish euro break-up, but at least the need to do a debt audit and above all to restructure the Spanish public and private debt burden. The new socialist party leader, Pedro Sánchez, has stated that if Podemos came to power, then this would take Spain back to the Great Depression of ‘29. One of his main economic gurus, José Carlos Díez, has discredited this Podemos proposal by saying that it would make of Spain the “Argentina of 2002”. Of course Sánchez is involved in a certain play on words when comparing the Great Depression to Podemos´ debt restructuring proposal, since he is very intentionally implying that something of the same kind happened in 1929 – when, as is also the case with the current crisis, the truth is that the Great Depression originated in the US and then spread to European countries. His economic adviser simply forgets what he wrote in a book he has recently published on the euro-crisis and Spain, in which he precisely proposes debt restructuring as a solution. What is fair enough as a purely intellectual exercise seems to turn into unadulterated populism once it is upheld by any emerging political party. The paradox in this debate is that virtually all economists who are directly working on the current euro-crisis, from very different ideological corners, are in one way or the other considering debt restructuring as an alternative to the current EU economic policy towards the southern European member states. Reinhart and Trebesch, Wyplosz and Pâris, Paul de Grauwe or Ashoky Mody--you name them--all of them have their own particular proposal for EU debt restructuring. Podemos seems to be contemplating little more than working in the same direction as other mainstream economists. None of whom could be described, by the way, as a “dangerous populist”. What has really shaken Spanish public and elite opinion on Podemos has been two very recent polls that confirm what rumour was saying not only in the enclosed intellectual and political circles but also in the streets: that Podemos could become one of the main political forces in a matter of months. Accordingly, the CIS public opinion survey of the month of November, just released, indicates that Podemos would be the first political party in Spain as per direct vote (17,5%, followed by PSOE, 14,3%) and the third one in terms of estimated vote (22,5% for Podemos, 23,9% for PSOE and 27,5% for PP). Another opinion poll from Metroscopia (a private polling company that makes surveys for EL País) showed even better results for Podemos. According to this second poll, Podemos would also win in terms of estimated vote (27,7% for Podemos, followed by PSOE, with an estimated vote of 26,2%). One might assume that the political and economic elites, after reading such polls, would be up in arms, redoubling their criticisms against Podemos. And it would be right to assume so–but only partially right. In fact, after these two polls came out, Ana Patricia Botín, successor to Emilio Botín in the presidency of the Santander Bank, made a statement saying that, “Podemos pursues economic growth in Spain, as other political parties do”. This is quite a departure from his father´s position on this issue who, a few days before his death, declared before a group of journalists that one of the things that preoccupied him most was “Podemos’ ascent”. Ana Patricia Botín´s declarations have been reinforced by the statement of the Santander Bank CEO, Mr. Javier Martín, declaring that “he is willing to meet with Podemos’ leaders”. Pablo Iglesias, recently elected Podemos’ secretary general, has even declared that Letizia, the Spanish Queen, would “like to meet with him”. Of course it is impossible to know the extent to which Iglesias’ statement conforms to reality. However, Zarzuela has neither disavowed nor confirmed Iglesias on this. Are we witnessing a second phase in the political and economic Spanish elites’ strategy to beat Podemos –a phase that could be labeled the “bear hug” chapter? Or are we just observing the starting point of a process of elite realization that Podemos could really win--therefore better to swim with the current than against it? Only time will tell. However, inspired in this by the best Oxonian betting tradition, my own political wit inclines me to wager a gallon of port on the latter rather than on the former.